The stopover in the charming South American yacht charter destination – the Galapagos Islands is demonstrating to be an exciting one for the Oyster World Rally. 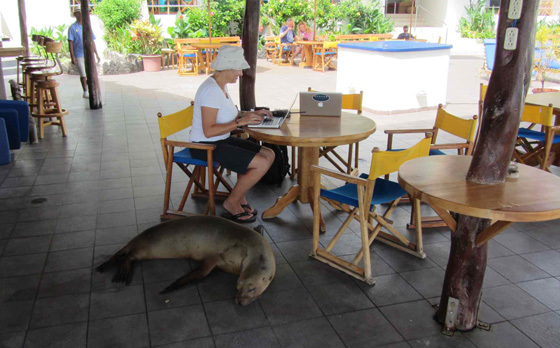 The team have set up an ‘office’ on the terrace of the Solymar hotel on the waterfront, where they are often visited by sea lions, iguanas as well as pelicans who, together with Oyster World Rally participants, all drop in for a swim and a drink at the hotel pool. 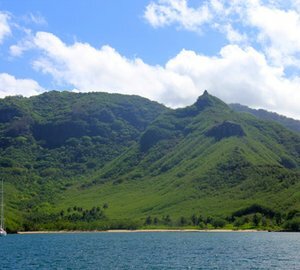 Those who have already taken tours of the islands have found that the geology of the Galapagos is amazing, but it is the wildlife that steals the show, and at Happy Hour everyday there are new adventures to report – snorkelling and diving with sea lions and penguins, sightings of hammerhead sharks, watching turtles nesting, the strange mating dance of the blue-footed booby, as well as giant tortoise ‘safaris’, and the fun of watching the pelicans and sea lions competing for scraps at the fish market whenever a catch is landed. Complete lack of fear of humans is what makes the wildlife encounters so special, Bob Morgan, owner of Crazy Daisy reports that the sight of a galapagos penguin whilst he was snorkelling was an unforgettable experience, when the cheeky penguin returned a second later and pecked his mask it was a different encounter altogether. Sea lions are also proving a popular dive companion – they love to play in the bubbles blown out by a diver, and if they don’t think one is providing enough entertainment will give a tug on his fins to encourage him to join their games. 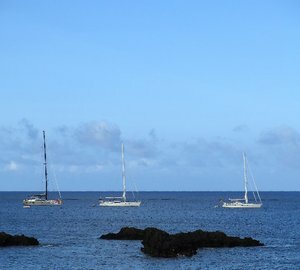 Several of the rally yachts have taken guides with them to venture into the protected areas of the Galapagos National Park where a lot of planning and paperwork is involved in getting permission but everyone agrees that it is well worth the effort. 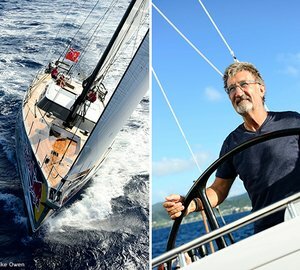 Paul Adamson, skipper of Oyster 885 sailing yacht Lush reported, “I feel completely privileged to have been able to visit such and awesome place and have every anchorage to ourselves”. The exploring goes on. Three dive boats have been chartered over the weekend for groups of rally participants to venture further into the underwater world, all hoping to share adventures with turtles, sea lions, galapagos and hammerhead sharks, penguins, and of course their fellow participants. 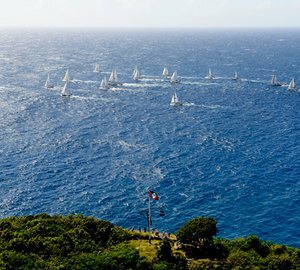 Please contact CharterWorld - the luxury yacht charter specialist - for more on superyacht news item "Oyster World Rally 2013: Stopover in the Galapagos".